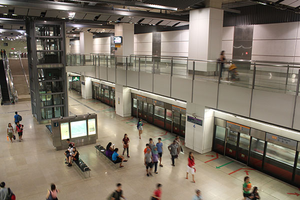 Serangoon (NE12/CC13) is an underground Mass Rapid Transit (MRT) station on the North East Line and the Circle Line. 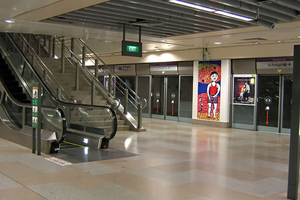 This is the second station in the MRT system after Dhoby Ghaut to have a travelator within the paid-area of the station. In February 2005, excavation for the tunnels under the existing North East Line station for the Circle Line interchange station hit an unusually large body of groundwater. This caused settlement of the North East Line station as well as the Serangoon viaduct directly above the station, with the station sinking by 1cm. As a result, trains bound for Punggol pulling off the station have to pass by the affected area at a lower speed. By the first few months of 2007, train speeds started picking up once again after the excavation was near completion. Memories of Childhood by Eng Joo Heng, can be found in the North East Line part of the station. View of Life by Sarkasi Said, can be found in the Circle Line part of the station. The author used 18 original batik paintings on cloth which were photographed and printed onto a sheet of glass. ↑ "Safety News, Special Edition." (July 2006, PDF). Land Transport Authority.